All transactions are safe and secure with a reliable history in online purchasing behind each of our associates. Buy the Frank Castle Revealed t-shirt to own Punisher clothing and merchandise. 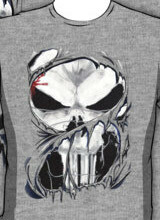 This torn style tee design features the trademark Punisher symbol from the Frank Castle costume visible underneath torn fabric. The Punisher's hatred for criminals has become a relentless obsession that he cannot always keep contained. Frank himself originally wanted to become a Roman Catholic Priest but instead joined the Marines, where he became a Navy Seal. Support Frank's cause in the unique Punisher t-shirt displayed above. In addition to the Frank Castle Revealed tee above, browse the Punisher Clothing Gallery for more apparel like men's and women's clothes, kids shirts or hoodies.